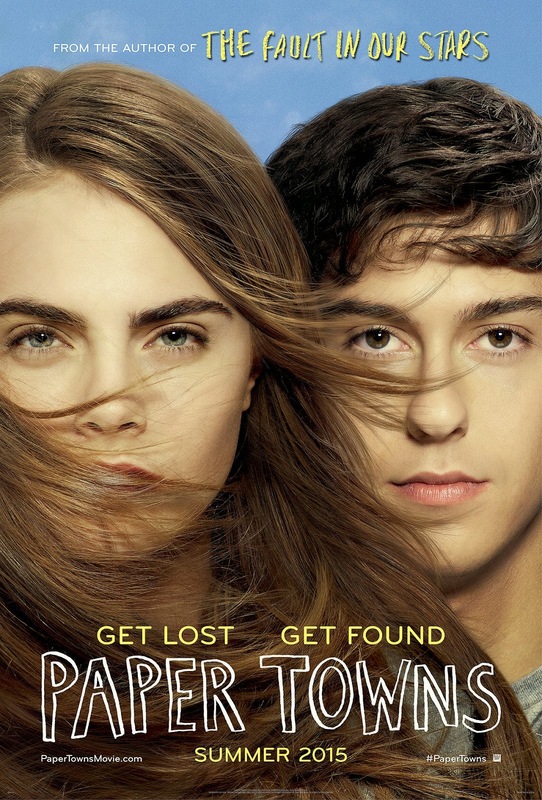 The latest John-Green-to-movie adaptation is going to be his novel Paper Towns, which I finally got around to reading last week, in anticipation of the trailer's release yesterday and the movie's release in July. It's the third John Green book I've ever read, after TFIOS and Looking for Alaska. Q (for Quentin) is a kid growing up in a subdivision in Orlando, living next door to Margo Roth Spiegelman since they were two. And yeah, he's totally in love with her, has always been in love with her. At the age of 9, they find a dead body in the park where they usually play. Spoiler: this body has nothing to do with the mystery that happens later, but it does in some way set the tone for things to come. The ever-intrepid Margo investigates and finds out that the man had apparently committed suicide. "Maybe all the strings inside him broke," she says, which is a pretty heart-breaking realization for a nine-year-old to grasp. She had shown up at Q's window to share her findings, and then just like that, she is gone. This shared experience forges a sort of bond between them, such that, even though they drift apart over the next nine years, Margo becomes the queen of their high school, and Q is just passably acceptable, there's an unspoken acknowledgment of their shared history. Margo actually keeps the school bullies from beating up Q and his friends. It's like that. They're no longer friends, but there's still something there. She's grown up to be beautiful and wild, with legendary stories of her taking off for short periods of time to pursue epic adventures. She is the girl you see in the movies with her hair blowing artistically in her eyes as she drives down the street. (No, seriously, it's in the trailer for the movie. I'm choosing to believe they were being very self-aware.) And of course, Q is ever more in love with her. But senior year is drawing to a close, and as Margo is preparing to head off to college with her athletic stud boyfriend, Q's chances are drawing to a close as well. Until, one night, she shows up at his window suddenly, just as she did nine years ago. Her boyfriend has been sleeping with her best friend, she tells him, and she needs a partner-in-crime to help her execute her eleven-step plan for revenge. Overwhelmed by her beauty, his long-standing love for her, and the promise of an escape from the mundane, Q agrees to help. Adventure DOES ensue. He's never felt such a rush before! He's never had so much fun! He's never committed so many near felonies! He's thrilled that maybe, just maybe, he'll finally have his chance with Margo Roth Spiegelman - after all, this night they're spending together has got to mean something, right? So tomorrow, when they see each other at school, things will be different? They are different. Different in the sense that, Margo doesn't show up to school that day. In fact, she's gone. So, the rest of the book, which I will not recap in such excruciating detail, is about Q trying to unravel the clues that Margo leaves behind in an attempt to find her. At this point, her family has given up on her, because she's taken off one too many times, and now she's eighteen, so they're no longer obligated to care. They're too broken to care. She no longer has a boyfriend and a best friend who care about her either, so Q takes it upon himself to investigate her disappearance, and he finds the trail of clues she's leaves behind, hoping it will lead him to her, alive and safe. Part 2 is all about him figuring out the clues and, in the process, figuring out Margo. Part 3 is all about the roadtrip he and his friends take to New York to find her, and the aftermath that follows. I know people might find the hijinks of Part 1 and the roadtrip of Part 3 the most compelling parts of the book, but for me, Part 2 is what spoke to me. Q is a remarkably perceptive kid and a very strong reader. Part of his "hero's errand" includes a very in-depth reading and analysis of Walt Whitman's Leaves of Grass, which Margo had left behind for him. His emotions ebb and flow as he tries to interpret the poetry through Margo-colored lenses, leading him at times to be thoughtful and contemplative (while considering what humans learn and reveal about each other and themselves) and at other times to be despondent (while considering the possibility that Margo's strings might have all broken, and that maybe she had wanted him to find her body, just like how they'd found that other body all those years ago. Spoiler alert: she's not dead.) In plumbing the depths of Whitman's words, his own thoughts, and Margo's actions, he comes to a startling discovery: that he's been worshipping at the altar of Margo when he really should be seeing her as a person. Reader, I'm going to be honest - after reading Looking for Alaska, and after reading the physical and personal descriptions of Margo from Part 1, I immediately was like, "Dude... does John Green have a MPDG thing?" (MPDG = manic pixie dream girl) MPDGs are universally regarded as kind of an irritating trope, and I was ready to be sorely disappointed in one of my favorite media personalities being one of those guys who is obsessed with them. So, after I finished Part 1, I immediately hit the Googlewebs and found this. If you're too lazy to read it, just know that John Green essentially says that Paper Towns is all about taking down this trope, and I was SO glad to hear this, because it meant that I could go ahead and continue reading without hesitation. I'm SO glad that he took this on. I haven't read many books or seen many movies that make it a point to show that this type of girl, whom the humdrum male protagonist has fixated on because he thinks she'll open up his world and give him a new lease on life, is an actual person who isn't just there to be the catalyst for his self-discovery - that she, too, has her own complex journey of self-discovery, and that it deserves its own amount of weight separate from his. Q realizes that this entire time, he's been in love with the idea of Margo, and it's only when he spends all these weeks trying to get inside her head that he realizes that he's pegged her wrong. (Though, granted, she did go to great lengths to cultivate this image of herself.) When Q finally realizes, "Margo was not a miracle. She was not an adventure. She was not a fine and precious thing. She was a girl," I wanted to stand up and applaud. (I didn't though, because that would've garnered weird looks from the people around me.) YES. SOMEONE GETS IT. However, that is just Part 2, and there is still the roadtrip to go. As if to drive the point home, Q's reunion with Margo, after 20-something hours of driving and a near-death experience involving a cow, is less than ebullient and romantic: "You didn't come here to make sure I was okay," she tells him. "You came here because you wanted to save poor little Margo from her troubled little self, so that I would be oh-so-thankful to my knight in shining armor that I would strip my clothes off and beg you to ravage my body." She calls him out on his assumption that simply being loved by him would be enough to change her and make her come home. It's arguable whether or not Margo changes, but at any rate, her decision is made. It's important that, by the time they get to the end, Margo is no longer this magical perfect creature to Q, but a person - a person with cracks, flaws, and an inner life that he's forced to consider. And I think that's a really beautiful thing.